Horses, in Vaastu, represent success and power. A Seven Horse Painting in your office ensures promotion in the job, success in your business and financial stability in your life while it is believed that seven horse painting in your home ensures financial stability in your life. The direction and placement of the seven horses painting is very important. While hanging the seven horses painting, one should make sure that it faces one’s home i.e. 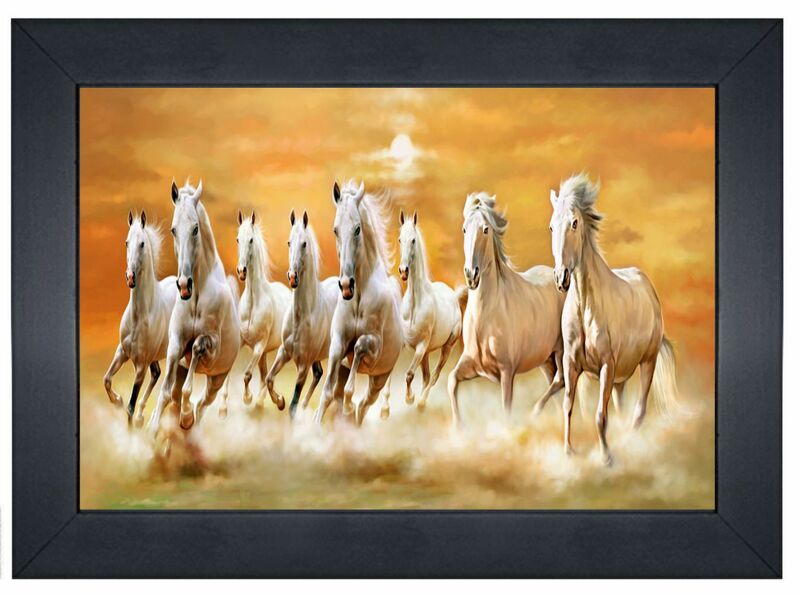 the horses should be moving into your home .It should be hung on the South or East wall of your home/office. FengShui Eight Horse Painting: Feng Shui eight horse painting is used to bring fame, recognition and triumph, mobility and promotion, bring steady and speedy growth in fame and success in career and life. Eight represents the eight aspirations of life, Career, Children, Recognition, Health, Personal Development, Marriage, Education, and Happiness. It is recommended to hang horse painting in fame area (South), as well as the Career area (North). A painting of eight galloping horses in the living room near the entrance of the house brings wealth and good luck in your home.It is also said the horses can help cure a struggling business and foster a good reputation. I was searching for something like this for quite a long time and at last I’ve found it on your blog. It was I was searching for something like this for quite a long time and at last I’ve found it on your blog. It was definitely interesting for all users i must want to appreciate your thoughts you have already shared though this post. definitely interesting for all users i must want to appreciate your thoughts you have already shared though this post. I was searching for something like this for quite a long time and at last I’ve found it on your blog. It was do my paper for me definitely interesting for all users i must want to appreciate your thoughts you have already shared though this post.